A wheat field in Provence, France, is almost ready for harvest. Climate change will likely cause wheat and barley yields to decline by 17 to 33 percent by the end of the century, predicts a new statistical model developed by researchers at the University of California, Davis, and Cornell University. 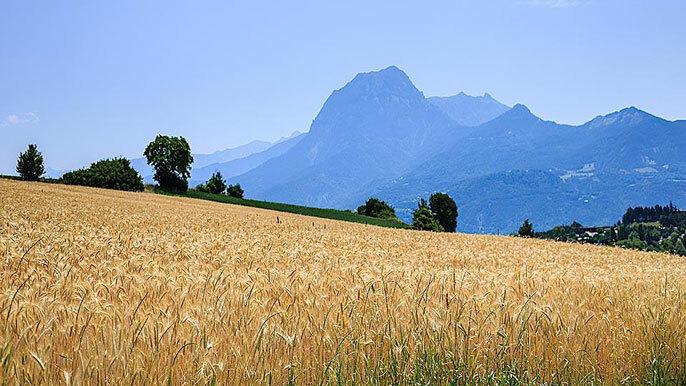 The study, based on 65 years of weather records and wheat and barley yield data from France, provides some of the first evidence of the negative effects of warming on wheat and barley yields in Western Europe. The findings are reported online in the journal Environmental Research Letters. The study is of particular importance because wheat is the most widely grown crop in the world and, along with rice, one of the top two sources of calories for human consumption. “This is not to be interpreted as saying that yield will decrease regardless of any technological improvements that may be made in the future,” said co-author Matthew Gammans, a UC Davis graduate student working with Professor Pierre Mérel in the Department of Agricultural and Resource Economics. “It does suggest, however, that climate change will lessen the rate of any yield improvements that will be achieved by technological advances,” Gammans said. The new model, developed by Gammans, Mérel and Cornell economist Ariel Ortiz-Bobea, is one of the first flexible statistical models applied to wheat and other cereal crops. Model flexibility, allowing for extremely high or low temperatures to have very different effects than the average temperature, is important in understanding the true effects of temperatures on yields. This model was developed from data spanning 1950 to 2015. The newly published study focused on three major crops: winter wheat, winter barley and spring barley, all of which are primarily watered by rainfall, rather than being irrigated. The winter crops are planted in the fall, lying dormant through the winter and then growing during spring and summer. Spring barley is planted in spring and grows through summer. Yields are projected to decrease by 21 percent for winter wheat, 17.3 percent for winter barley and 33.6 percent for spring barley under the most severe warming scenario. The negative impacts of increased heat during climate warming won’t be offset by a decrease in extreme cold temperatures during winter. Possible increases in rainfall would help mitigate the effects of heat stress but would not be sufficient to offset the negative impacts of warming temperatures. The model did predict that if technological improvements continue on their current trajectory, they could offset most of the negative effects of climate change. Such improvements could include new heat-tolerant crop varieties and improved farming methods. “We now want to explore what role adaptation to climate change will play in mitigating negative impacts on yields of wheat, barley and other cereal grains,” Gammans said. Agricultural data for this study was made available by the French Ministry of Agriculture.